Jaycie Case, a senior human development and family studies major at Stephen F. Austin State University, was recently recognized by the National Council on Family Relations for her "exceptional accomplishments and involvement in scholarship, leadership and community service in family science," according to the NCFR. A member of SFA's Jacks Council on Family Relations, Case has helped with several community outreach projects. 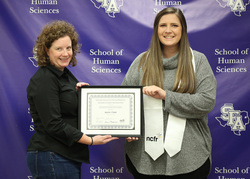 NACOGDOCHES, Texas - Jaycie Case, a senior human development and family studies major at Stephen F. Austin State University, was recently recognized by the National Council on Family Relations for her "exceptional accomplishments and involvement in scholarship, leadership and community service in family science," according to the NCFR. Dr. Jennifer Newquist, assistant professor in SFA's School of Human Sciences, nominated Case for the NCFR Honors Student Recognition, which is a national award. "I nominated Jaycie because of her dedication to the field of family science through her academic work, and leadership as president and public relations/membership officer for the Jacks Council on Family Relations," Newquist said. "She has completed several community service hours related to family science with the JCFR, as well as her sorority. She has been a major asset to this organization." An Aledo native, Case has been a member of SFA's JCFR since 2016, which is the local chapter of the NCFR. "When Dr. Newquist nominated me for this award, I was truly honored," Case said. "She is one of the inspirations for my career choice to become a college professor, and knowing that she believes in me enough to nominate me means the world." JCFR is a student organization focused on building networks and helping families within the community. It is part of the School of Human Sciences. Each semester, organization members host various outreach programs. During her tenure, Case has helped with Thanksgiving Homebound, a food drive for families during the holiday; Family Fun Day events; diaper drives; and nursing home outreach. "Ever since joining JCFR, I have always loved being a part of the community outreach we do," Case said. Case is scheduled to graduate this fall with honors and begin her graduate studies at SFA in the spring.